In a mixing bowl, beat the oil with eggs, sugars, and vanilla extract. Combine the flour, soda, baking powder, salt and cinnamon; add to the wet ingredients; stirring until blended. Fold in the shredded zucchini and carrots. Fill muffin cups about 3/4 full; sprinkle with cinnamon sugar or granulated sugar, if desired. Bake for 20 minutes. Melt the butter, corn syrup, brown sugar and salt together over medium heat. Bring the mixture to a boil stirring constantly. Boil without stirring for 5 minutes. Remove from the heat, stir in the soda and vanilla. It will foam! Pour over the popped corn and mix well. Spread the coated corn onto large buttered cookie sheets and bake for 40 minutes, stirring every 10 minutes. Let it cool and eat! Little hands won't be able to stay out of it! Side note: I cut the recipe in forth for the above pictures. We had also eaten 70% of the treat in the 2nd picture! My kids love this meal! Preheat Oven to 400. Split English Muffins in half, spread app. 2 TBLE sauce onto each muffin. 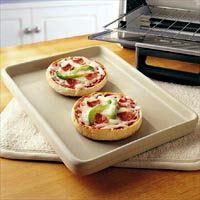 Sprinkle evenly with toppings of your choice. Bake 15-18 minutes or until golden brown. ***This recipe was taken from THE PAMPERED CHEF. It came with my stonewear pan. The time should be the same but check it a bit earlier if using a regular cookie sheet, stonewear seems to take a bit longer.